Earn up to 539 Points Points. 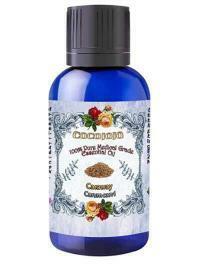 Cinnamon Oils have been used for centuries in Asian cultures-Chinese and Indian. Among the various benefits which cinnamon offers, one of the most important is its role in maintaining healthy skin. 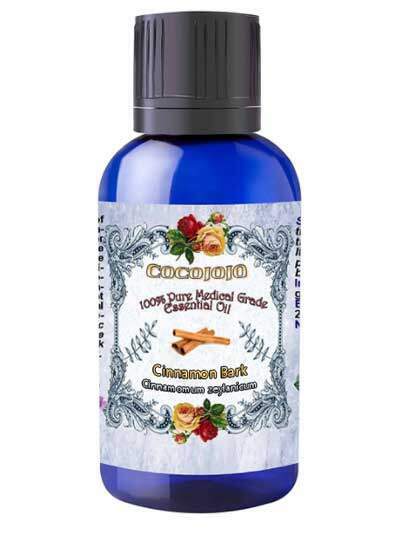 Cinnamon Essential Oil is an amazing oil and is a must have for household use… especially if you seek natural skincare options. This oil is a perfect natural choice for many of your skincare needs. How to use COCOJOJO Essential Oils ? The scalp responds well to essential oil treatment. Add some drops or Cocojojo scalp treatment essential oils blend into jojoba or Hemp carrier oil blend, massage into scalp and protect with a shower cap. Leave for a 1-2 hours, rinse well with shampoo. Add 3-5 drops of essential oils blend to a bowl of steaming water and agitate. Cover head with a towel and inhale vapor of the essential oils blend for up to 10 minutes. Repeat several times a day if necessary. Body Bath – run a warm bath, add 5 – 10 drops of essential oils blend and stir gently. Immerse yourself for about 30 minutes or more and relax. The essential oil will penetrate your skin and as you relax in the warm water. Do not add extra essential oils as a top up. Foot Bath – When your feet are tired get a bowl full of warm water, add 2-3 drops of essential oils, stir gently and relax your feet for 10 to 15 minutes. Blending ratio – 10 drops of essential oil to (1 Gallon). Hand Massage – Mix the essential oil with the carrier oil and put a few drops of blended oil in the palm of the hand; rub gently with the thumb and then do the same on the top of the hand. Blending ratio: Up to 5 drops of essential oil to ½ Oz of carrier oil. Put a few drops of blended oil on the foot and massage top and bottom slowly and massage the sole of your feet with the thumbs. Blending ratio : Up to 5 drops of essential oil to 5 ml of carrier oil. Cautions: Essential oils are very potent and can cause skin irritation. If you have sensitive skin, always use low dilutions of essential oil to the carrier. Disclaimer: Before purchasing please note that all information contained within Cocojojo store and this page are for reference purposes only and are not intended to substitute the advice given by a pharmacist, physician, or any other licensed health-care professional. Our products have not been evaluated by the FDA and are not intended to diagnose, treat, cure, or prevent any health condition or disease. All our products are for external use only. Unless your Medical Doctor allow you to use this product it should not be used by anyone who is pregnant or under the care of a medical practitioner. The information on this page has been compiled from published sources and is provided only as a guide. Although every effort has been taken to ensure that information published on this page is correct and up to date, Cocojojo LLC cannot guarantee the accuracy of all information presented, and accepts no liability in respect of any omission or error. The customer should always satisfy themselves as to the ultimate suitability of a product for an intended application. Cocojojo LLC accepts no liability in the unlikely event of an adverse reaction occurring when using one of its products. All facts, details & recommendations on our page are provided for information purposes only and are not intended to diagnose, prescribe or replace the advice of professionals. Our products are not a medication, and we can only make recommendation for suitability of our products in certain conditions. Any recommendations accepted by a purchaser are accepted entirely at the purchasers risk. By purchasing our products you accept responsibility to check with a professional before using any products that may interfere with drugs or medical conditions. By purchasing our products you recognize and accept the fact that that some natural ingredients, essential oils in particular, may still cause sensitivity in susceptible individuals and that Handmade Naturals Limited will not be held responsible for such occurrences. We encourage those with sensitive skin to make a patch test on the skin for possible reactions. Cocojojo LLC accepts no responsibility for incorrect use of information or products.